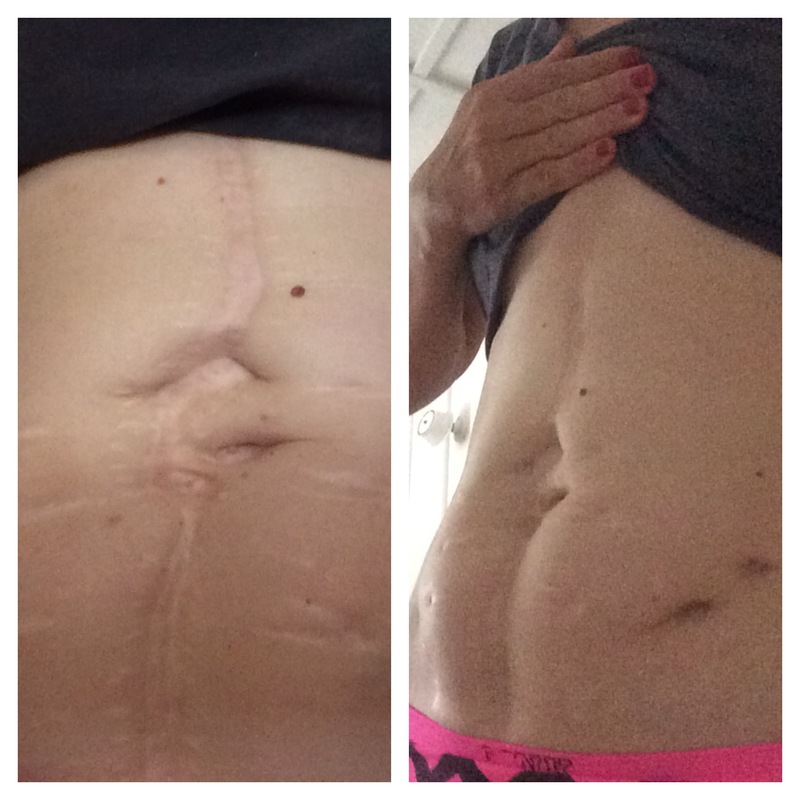 For a long time I have been embarrassed by all the scars I have on my belly. I have actually felt shame that I didn’t have the super flat and amazing abs that I had all my life, pre-cancer and that we see in so many pictures. Last night, as I was watching a video of myself doing yoga on my paddleboard, I saw my scars and imperfections for what they truly are: beautiful, and a deeper healing is setting in. I wouldn’t be alive today if these scars weren’t there. These scars are an ever constant reminder of the hell I went through as a stage 3 ovarian cancer survivor, getting a 5 pound tumor removed, then 50 tumors removed, then a hysterectomy, then a hole in my colon, getting an infection, then being attached to a vacuum for 6 weeks, then a 12 hour surgery to remove more tumors and organs, then an ileostomy bag, then, and finally, freedom. These scars show the story of hardship and trials, pain, and tears of not only me, but my family and friends. I have wanted to get as far away from those memories as I could, for a long time. I have slowly faced them as I have been able. This is my next step in the journey: showing them, being vulnerable and open, facing fears, and inviting in even more healing. I have prayed for them to dissipate. I have tried all sorts of creams and wraps and detoxes and exercise and yet, they are still there. The mountains and valleys, the craters, and holes, the lumps of fat displaced from all the surgeries, the crevices of stiff scar tissue that try to hold me back. Today though, I am making the choice to see that these scars also tell an incredible story of hope, of courage, of the power of prayers and support of family and friends, of medical staff who were creative and revolutionary; all these people who believed. These scars do tell of the ugliness of cancer, the evilness of disease, the destruction of surgery, and yet, there is a beauty in them: the power of human ingenuity, God’s miracles through our work, that our thoughts of limitations are only in our minds, that truly anything is possible, and that there is beauty in imperfection. These scars show the story of where I have been, who I am today, and in my story, I wouldn’t be where I am, doing what I do, without them. So, I embrace them. I know that I will continue to walk out this journey called life, every day. Today marks a new one though, and I’m setting up a marker. Hope exists. Nothing is impossible. Keep moving forward. Fail a lot. Have the courage to stand back up again, and maybe, just maybe, we can change the world through our courage. Thanks for reading and loving. This brought tears to my eyes. I also have crazy stretch marks & a c-section scar that has haunted me for 9 years but recently just embraced them as the beautiful birthing pains and stretching of my amazing twins. Wouldn’t change it for the sexiest stomach in the world. Love you. You’re an incredible example of true strength. That word seems minimal to what you truly are inside. You are a warrior. Anna, birds of a feather we are, in so many ways. Thank you my dear one!!! We love you so much and praise God for your healing and strong faithful life! God has so many plans for you as you have help so many….you are amazing! Incredibly powerful and beautiful words Audrey. You are an incredibly amazing person and survivor. I too have lots of ugly scars I have been embarrassed about for years, since I was 16 to be exact and went through surgery from being hit by a drunk driver. For years they haunted me but now I wear them with pride. To love yourself, imperfections and all, especially those imperfections you could not control, is to truly know love and acceptance. Loving ourselves for who we really are is probably the hardest thing to do in the entire world. I am writing this because you so strongly inspired me with your words. My words are unplanned and directly from the heart, but know that you are beyond powerful and a true inspiration! Aly, you are a treasure. Thanks for your heart and kindness here and always!!! Thanks so much for sharing. You too are an integral part of my own healing. I feel very blessed and I know so many others think the same. May our gracious and merciful LORD continue to bless you and all your endeavors in ministering to us all. Norman, thank you and amen! Here’s to healing! You are such a strong, lovely, interesting and courageous friend. You’ve always been beautiful- inside and out- nothing can change that. I’m lucky to have you in my life. Love you! Absolutely LOVED reading this!! Thank you, Audrey, for being open, honest, real, true, vulnerable, courageous and brave!! I am truly speechless after reading your story and utterly amazed at what a strong, amazing woman of God you are! !